Community Gro Inc is a not-for-profit community organisation that provides services to support individuals and families to grow in confidence and independence. We do this through a range of programs developed in partnership with the community. We deliver support to minimise the risk of family breakdown from social and economic pressures. Our quality services are provided by both paid and unpaid staff through best practice principles. Our community services are delivered through Centres that provide a welcoming meeting place where anyone can come to gather, obtain information, support, referral and access resources. both structured and situational with a focus on well-being and building capacity, resilience and knowledge. networking including the opportunity to link and form relationships, to volunteer and be involved. by relieving isolation, loneliness and boredom, and building the sense of trust, safety and belonging, activities can reduce the need for expensive and intensive services. to enable sustainability of the local community’s wellbeing through addressing a range of needs. to address social justice issues through awareness raising, community education and social action. the Community Centre is a local facility that is accessible, safe and welcoming for all community members. Community Gro is governed by a volunteer Board of Management made up of professional people from a mix of legal, financial, marketing and development industries. The Board is responsible for determining all matters relating to governance, including, ensuring an appropriate policy framework is in place to manage the organisations operational procedures. To see people and communities thrive supported by sustainable programs and economic opportunity. To grow individual, family and community capacity towards self-determination, through social and learning opportunities that are accessible to all. Community Gro facilitates a range of services through its major programs: Upper Ross Community Centre; Garbutt Community Centre; Community Connect Program; Upper Ross Family Support Hub; Home Interaction Program for Parents and Youngsters (HIPPY); Community Visitors Scheme; and Annandale Outside School Hours Care (OSHC). Upper Ross Community Centre receives funding through the Queensland Government Department of Communities, Child Safety and Disability Services. 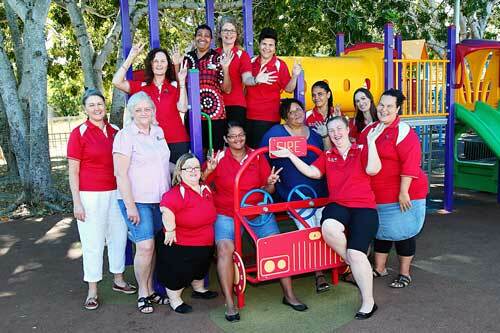 Community Connect Program receives through the Queensland Government Department of Communities, Child Safety and Disability Services. Family Support Hub receives funding through the Queensland Government Department of Education and Training. HIPPY Upper Ross receives funding through the Australian Government Department of Social Services through Brotherhood of St Laurence. Community Visitors Scheme receives funding through the Australian Government Department of Social Services.